VPNTunnel is part of a company called Edelino Commerce Inc.
They’re a Seychelles-based VPN provider, with 800+ servers spread across 32 countries. They’re in many of the usual locations, such as the US, UK, and the EU. But they also have some less usual locations, like Argentina and Israel. Because your VPN’s performance is often dictated by its location. And a friendly jurisdiction like the Seychelles is another good sign. In this VPNTunnel review, we’ll unveil whether they’ve lived up to a strong start, or quickly fell flat in the end. VPNTunnel has servers in a few uncommon locales. And their parent company’s location bodes well for privacy. Here’s a quick list of the top benefits you can expect. Top intelligence agencies around the world are increasingly spying on their own citizens. But that’s not news to most people. What IS news, is that many of those organizations will freely share data between themselves. That means data collected by the CIA in the U.S. gets spread around North America, the U.K., Europe, and Australia. The Eyes allegiances originally sprung up around World War II, but have only expanded since. Thankfully, VPNTunnel’s Seychelles location places them outside any of these data-sharing agreements. Only one small hang up, though. 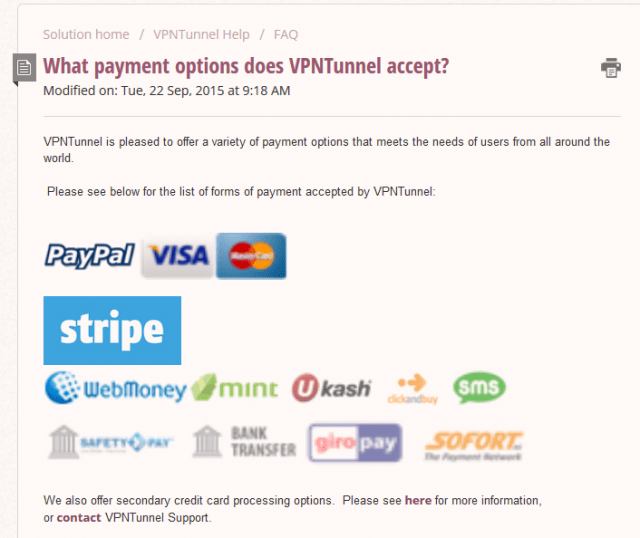 VPNTunnel uses a third-party payment processor called Online Sales Solutions LLC. Which is based in the U.K. Which IS an OG Eyes member. They only thing they’d be able to show is that you are a customer (and which method of payment you used). Otherwise, your actual session data should be in the clear. Some VPNs require a lengthy verification process when you first sign up. You pay your money. Create an account. But you can’t actually use the damn thing until they give you the manual clearance. Unfortunately, VPNTunnel took forever to deliver our verification email. It took longer than 24 hours to get access. They also wanted us to take an extra step to download Microsoft Visual Studio (similar to another VPN we’ll review soon called AzireVPN). But after those first few initial hangups, the overall experience was great. The app itself was very lightweight, coming in at less than 5MB for Windows. It was also pretty fast, with no noticeable lags. The user interface was also simple to use. So overall, we’ll give them the benefit of the doubt, and lump this one under the Pros. VPNTunnel works with most platforms under the sun. Even Windows XP. No joke. Fortunately, they also allow up to five simultaneous connections. So you can take advantage of most of these at the same time. You can also set up your router, protect your entire Internet connection, and connect as many devices as you’d want. VPNTunnel seems to allow torrenting and P2P. That means they’ll keep your connection truly anonymous, protecting you from other ISPs or people connected to the same Bit Torrent swarm. Because without a VPN, you’re like a sitting duck for copyright owners. They won’t hesitate to issue a DMCA Takedowns, fine you, or even bring criminal charges. No one is trying to connect to Netflix Moldova or Uganda. No offense meant. It’s just that the content and licensing restrictions aren’t as affected in those places. The U.S. is generally near the top of the list. Especially for people abroad who still want them some House of Cards. Well, we’ve got good news for you. Despite Netflix cracking down on VPNs lately (and geo-blocking them), the two U.S. servers we tried both worked. The only drawback is that other regional servers did not. But we’re still classifying this one as a Pro, simply due to the sheer number of VPNs that don’t unblock Netflix these days. 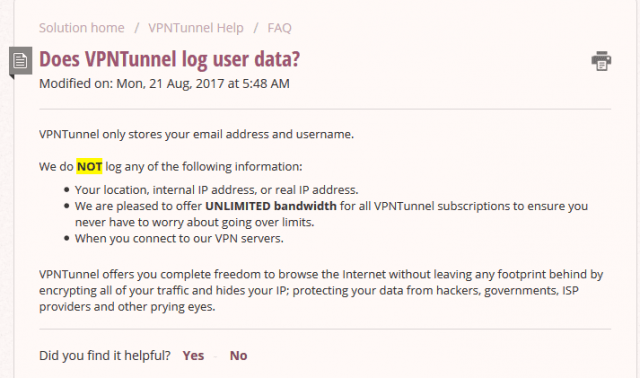 The last time we reviewed VPNTunnel, they only supported the OpenVPN and PPTP protocols. Some other VPNs we’ve reviewed might support up to six different tunneling protocols. That’s good for people who need options. Maybe they’ve got old devices or struggle on sluggish networks. That last one, in particular, is a security nightmare. It literally can be hacked in under three minutes. But OpenVPN is legit. It’s the de-facto standard of choice for most VPN companies. That, in addition to their industry-standard AES-256 encryption, means they’ve got the basics covered at least. The limited options for protocols have this one on the fence. So I’m sticking it here, right before the Cons. VPNTunnel has a lot to like. Unfortunately, we discovered that they also have a lot to dislike. They would do one thing well, only to drop the ball in another area. Uh huh. Heard that one before. Their servers will not track your location, IP addresses, browsing history, or connection times. They do need your username and email address for account purposes, so that’s not such a big deal. Then why is their logging policy listed as a Con? This little paragraph exposes one of the deep, dark secrets of the VPN world. Namely, the questions surrounding VPN servers. If your VPN doesn’t log data but doesn’t actually own their own servers (and is instead renting from a third-party), that logging policy doesn’t really mean anything. Plus, they’re talking about complying with law enforcement agencies. So even though they’re technically located outside of any alliances, they’re leaving a loophole open for someone with a warrant to crawl through. Call us skeptics, but that’s a little questionable. Why sign up for a VPN in the first place? For people in unfriendly VPN countries, it’s anonymity. You can’t risk exposing your true location when browsing sensitive sites. The problem is that you’re not always as safe as you think you are. Even with a VPN connection enabled. Poor VPNs will actually ‘leak’ your data, exposing your true IP address for all to see. This means your IP isn’t really hidden and your data isn’t fully protected. Thankfully, VPNTunnel passed each of the six DNS leak tests we put them through. But the party pooper came in the form of a virus found in the installation file. 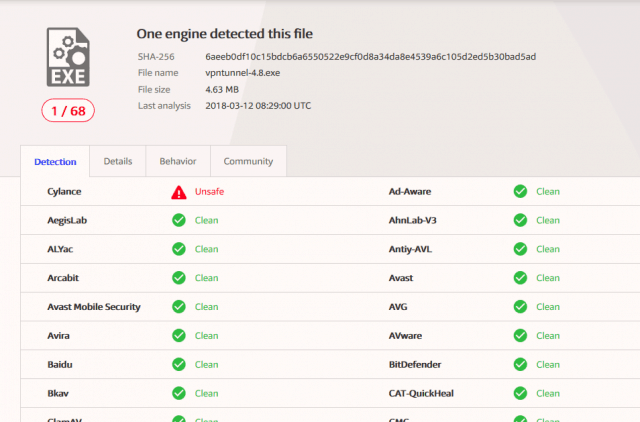 We run each VPN software’s files through VirusTotal just to double-check everything. And this time, we were glad we did. Granted, it was only one virus checker out of 68 that found it. So it could be a false-positive. But it also might not be. And that’s a needless risk most won’t want to take. Especially when you don’t have to with so many other Better VPNs out there. The Tor browser can add an extra layer of privacy to your connection. But VPNTunnel doesn’t have one. We even verified this with customer support. So no sense going on and on about it. 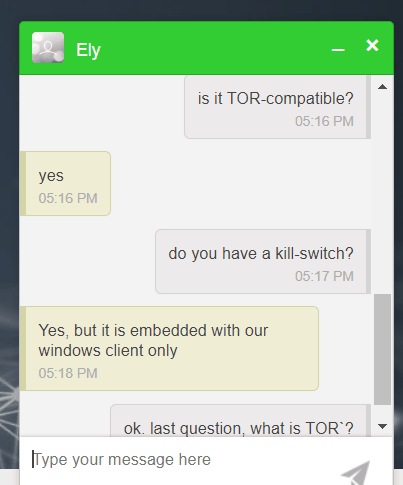 Unfortunately, they also don’t have a kill switch for most devices; their customer support claims to have one embedded in their windows client, but that’s barely sufficient. These come in handy when your WiFi connection drops unexpectedly, for example. When that happens, your entire browsing session and IP address will be broadcasted to your ISP. A kill switch cuts your connection before that happens, saving you with one last-ditch effort. However, again, they don’t have one for most devices. Disappointed. VPN connections wrap you uptight, relaying all of your data between their servers before your browser can fetch any data. That extra layer often equates to a slower experience. It might add a few milliseconds when trying to upload or download data. Overall, VPNTunnel comes in as the 35th VPN we’ve tested (out of 78). Their E.U. server wasn’t too bad. The upload speeds are a little slow, but a download dip of only 9.2% is pretty good! We should have stopped here, to be honest. Because the next server we connected to was very slow. Now, our initial speed tests came in with a download speed of 97 Mbps and the upload speed was 53 Mbps. But this server was only able to deliver ~2-3% of those speeds. Any slower and it would be standing still. That’s especially awful if you wanted to try and watch Netflix. Remember that Netflix streaming only worked on U.S. servers? Welp. With server speeds of 2.73 Mbps and 2.62 Mbps, you won’t be streaming it anytime soon. Unless, of course, you like watching image stills, instead. We like to test customer service departments to measure both answer quality and response time. It doesn’t matter if they send you an incredibly thorough response… if it’s a week overdue. You might have an urgent fix that needs to be addressed quickly. We fired off an email to VPNTunnel’s support team but had to wait 16 hours for them to respond. Not great. Especially after that initial 24-hour verification lag. So we gave them a second chance, sending a simple reply with a few more queries. Unfortunately, that one also took nearly a day to see anything back. This sounds super nitpicky, but the replies also felt a little cold. Like someone was just trying to blast through as many tickets as possible in the shortest amount of time. I get that. Stretched too thin, busy with other stuff, etc. But no name or explanations or anything? All of VPNTunnel’s features are available on each plan. So the only pricing different comes down to how long you want to commit. Their month-to-month option comes in at the upper end of the scale at $9.99/month. But that number quickly drops to $6.66/month for the quarter or $2.99/month for annual. That last one is a total savings of 70%! You can take advantage of that massive savings by paying with major credit or debit cards. You can also make direct bank payments, go through PayPal, or pay anonymously through fifteen different cryptocurrencies for anonymous payments, including Bitcoin, Litecoin, and Ethereum. Unfortunately, for those over the age of 80, cash is not accepted. There is also no free trial period to test drive their service without buying it. But they do offer a seven-day money-back guaranteed refund (without any bandwidth limited) if you are dissatisfied. They started off well. They give you one positive element, only to buckle with two drawbacks for each one. The app is super user-friendly. But the 24+ hour verification before getting to use it was unacceptable. There were no DNS leaks. But a virus scan came back positive. Netflix worked on U.S. servers. But those servers were too slow to actually stream anything successfully. This list could go on and on. And overall, it left us a little frustrated, to be honest. That’s ultimately why they only come in at the 39th position overall. They’re not the worst by any stretch. We’ve seen far, far more bad ones. But they also don’t really excel at anything, either. And there are too many question marks to cause concern. If you want Netflix VPNs, there are better options. If you want fast VPNs, there are better options. Or if you want cheap VPNs, there are better options as well.